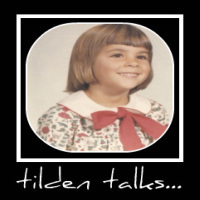 tilden talks...: Boys and Cars...and Girls! A couple of the guys that I work with are automobile junkies. They buy and fix up cars during the wintertime. I always attribute their obsession to the fact that they don't have girlfriends. Whatever the case, these guys often compete with each other at car shows. Last weekend I took in one of the shows to show my support. Mike entered a chrysler 300. The 300 got a lot of attention at the show. Mike is a dispatcher for emergency services in town and he had a good amount of people show up to vote for his car. With his chest puffed out, Mike told me to make my vote based on my opinion of the best car in the show, while pointing directly to his car. I moved on to see the other cars. I came across a very pretty cadillac sts belonging to my boss' son. RJ's STS got as much attention as Mike's 300. Mind you, these guys spend all winter working on these cars but they also drive them. So any nick or ding gets immediate attention and both guys help each other with their cars. I began to wonder if they really cared who won. Continuing on, I met up with Javier. He is new to car shows and at 18, he entered his first car, a lexus rx. The Lexus was his Granddad's car and Javier received it as a gift when he graduated high school. RJ told me that Javier has a huge family, all in attendance and he thought Javier's car was a really good first time entry. Granddad actually helped Javier trick the car out for the show. I didn't hang around to find out who won first prize, I'll find out when I go to work tomorrow. But when I left, I noticed a rather pretty girl hanging real close to Mike and RJ was talking to a couple girls who seemed genuinely interested in his car. Maybe this winter will be a little different. Nah, if the girls are like me, they'll just learn a whole lot about cars and what their guys looks like with their heads in the engine and their butts in the air.